My goal this morning was to get as far as La Grande, Oregon. Then, I could leave as late as 8:00 am Saturday and still get to the airport on time to meet T’s flight. I started off strong, despite thick low clouds and rain showers. Outside of the jammed population centers of Provo-Salt Lake-Ogden and the multitudinous communities serving them, I had only minutes to enjoy the view until the weather got bad. 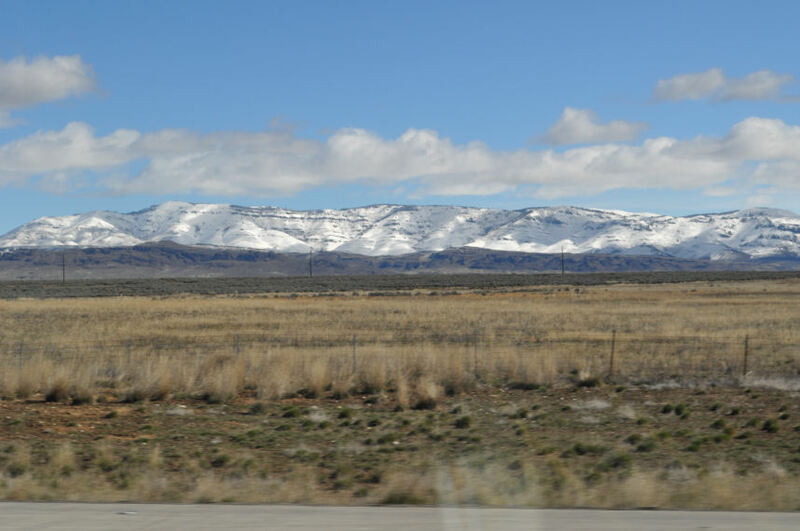 I climbed north out of Utah and into some higher elevations, and the dragon wagon was skittering all over the highway in a blinding blizzard and rapidly deepening snow on the road. The signs still taunted me with Speed Limit: 75 mph, but me and the triple-trailer trucks were crawling at about 45 mph. My windshield wipers were working only sporadically, and the muddy slush kicked onto my windshield from the semi trucks was putting me into a mild state of panic, so I decided to pass them, one by one, as I came to them. Yyyiiiiiikes a-mundo white-knuckling it through the snow on the highway and blizzard visibility, car fishtailing beside the huge trucks… This went on for miles and miles, up and down over the mountains of the border country. 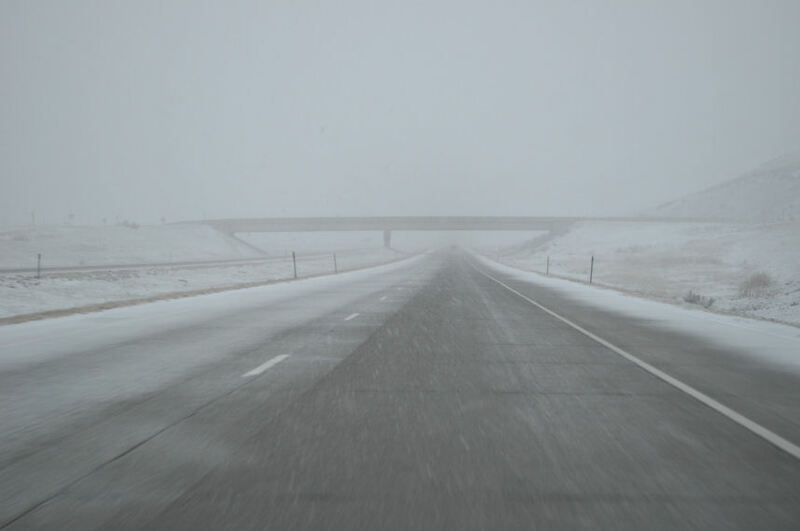 Those conditions did not stop as I crossed into southern Idaho, but I did give a silent cheer to myself for being in my homeland for the moment. The snow didn’t let up till I dropped into the valley on the way into Twin Falls. I got through the Treasure Valley ok, waved to my Pa in Melba, Gramilda in Nampa and my brother Eli in Boise, and moved on through. Tossed some more virtual hellos to LaDale in Ontario and Sandi in Vale. Too, too many people to visit, you know? If you visit some but not all, you’ll be in big trouble when the neglected relatives find out. Best to visit everybody, or nobody. My stepfather Jim said that due to incoming inclement weather, I should get to at least Pendleton today. Oregon tried to thwart me by dropping the speed limit to a painful 65 mph, but I pressed on. I came through many heavy rainshowers, but only a rare light snow shower, so the weather was not a real problem for the remainder of the trip (only my windshield wipers!) Because of crossing a timezone backward, I gained an hour, and it was only 1:30pm when I got to Pendleton. Sooo… I decided to buckle down and go all the way home. I did 738 miles in 10 hours. The eastern end of the Columbia River Valley is dramatic in a sense, but I find it boring: giant wide river in a shallow desert valley. But keep heading west and there are sights that make me gasp in wonderment. After all I’ve seen this week; after the astonishing, incredible mountains and cliffs and valleys and rivers… nothing is more incredible to me than the western Columbia River Gorge. Portland, Oregon is located in a place of indescribable dramatic beauty. Of course my photos here were shot over my shoulder through the car windows as I drove through, so the quality is poor and they do little to support my argument that this is a place of unequaled beauty. Still, you have to believe me. I am a very lucky girl to be able to come home to this! Update! I had a chance to grab some photos of the Gorge with my new camera. See my post with some of the awesome photos. Hey there, stranger. Elisia and I are really enjoying following your travels! The blog looks and reads like a dream. Keep it up! You remain an inspiration to us. You’ll be pleased to know that we’ve done a little tiny bit of updating to our blog. Forward us that link again as I have inadvertently obliterated your last comment. Yay, a blog update! I’ll go check it out. What link?